Untitled is an extraordinary medium-scale Calder mobile, executed during a pivotal decade of personal and artistic exploration for the artist. In the 1950's, he began creating monumental works and architectural projects as well as continuing to refine the mobiles that were his best-known works. Throughout the fifties, he exhibited in numerous U.S. and European cities and traveled to France, Germany, England and Italy. 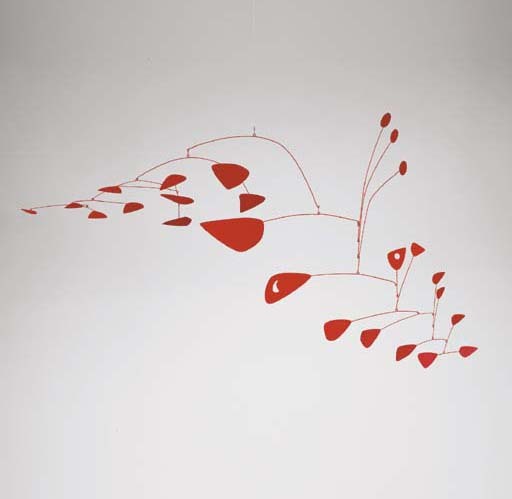 Calder's incorporation of random and unpredictable shifts of wind adds the Surrealist element of chance, a concern that Calder embraced early in his career. Discussing the movement of his sculpture, Calder himself admitted, "Oh, I know pretty well what will happen, but it's all 'cut and try,' and sometimes they surprise me" (as quoted in Calder's Universe, New York, 1976, p. 265). Scattered elements are punctured with small shapes that both influence the movement of the sculpture through the air as well as anthropomorphisize it with suggestions of mouths and eyes. Hypnotically, the smaller clusters rotate independent of the overall structure which itself lazily moves, referencing the rotations of celestial bodies. Indeed, movement has always influenced Calder, who claimed that his first inspiration for his work was the cosmos and planetary systems. Untitled appears to be directly related to the artist's Sumac series. Executed concurrently, they share the same color, forms and overall structure. That series was inspired by the sumac tree/bush, in which Calder abstracted its fiery red leaves and bud-shaped accumulations of berries into biomorphic shapes that dance throughout the sculpture. The sumac's curious properties--its berries are harmless and can be used to make tea, whereas the leaves of the poisonous strain of sumac are dangerous-make it an ideal subject for an artist who was influence by Surrealism's visual riddles and double entendres. This work was purchased in the year of its creation from the venerable Curt Valentin Gallery in New York. "The foremost American gallery for sculpture" (M. Glimcher, Alexander Calder: The 50's, New York, 1995, p.7), Valentin represented Calder and mounted six solo exhibitions between 1944 and 1955.